I've written about experimenting with wearing religious headgear previously, as well as some of the issues its raised with my family. I (mostly) understand where they're coming from, but I think they still don't really have a sense of what I'm thinking. They don't understand why I want to "single myself out," "make myself a target," or be so visibly identified as Jewish if I'm "not religious." While reading through some op-eds over the past week written by Sikhs in response to the shootings in Wisconsin and their thoughts about wearing visible markers of their identity I saw many of my own thoughts reflected in their words. As Rajdeep Singh put it, "devout Sikhs express their religious commitment by wearing a turban, which signifies nobility and a willingness to promote justice and freedom for all peoples," adding that the turban is a "declaration of Sikh identity." In short, the act of wearing identifiable clothing establishes a commitment to identify with-- and live up to the ideals of-- one's religious/cultural group. Keeping kosher is “a way of asserting that you are a conscious Jew,” explains Rabbi James Ponet, chaplain at Yale University and a family friend, “when you join friends out for dinner but decline the lobster, shrimp, oysters and all the meat entrees [or] when you ask the waiter if the tomato soup” is made from vegetarian stock. Echoing Achad Haam’s pithy observation about Shabbat observance, one might hold that more than the Jews have kept kosher, kosher eating has kept the Jews. A Jewish atheist’s children might grow up with a learned distaste for pork and thereby call themselves Jewish. For me, the twist here is not that one would specifically want to cultivate a dislike for pork in children (much less the pseudo-scientific silliness claiming that one absorbs the "nature" of animals one eats-- who wants to be like a cow or a chicken?) as much as impart a deep respect for traditions and culture of one's ancestors. It's not that non-kosher food is bad, it's that this is part of our heritage and one way of connecting to it and others in our communities. For me, that shift in perspective is key: it's not about being observant or religious, per se, at least not in my father's way of thinking. It's about being conscious, serious, and engaged. It's about finding more ways to connect yourself (on your terms), not less. To me, the visibility and accountability-- to oneself as well as others-- are part of that process, whether I meet certain people's litmus tests or not. If there was a particular visual identifier that read, "Jewish but not Orthodox," I'd be all over that. But so far it doesn't seem like that's really a choice. By taking on the visual aspect, the tradition's "vote" becomes a little stronger, a little less easy to just shrug off. That's not to say that I think that wearing a kippah would make me Orthodox, but I think you have to grapple with the tradition a little more once you're no longer invisible-- to a degree, you lose your deniability, let's say. 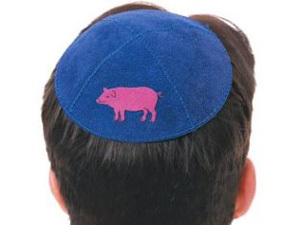 That's part of what intrigues me about wearing a kippah and being identifiable to myself as well as others, and I think that's also part about what drives my parents crazy-- the idea that I would want to be thinking of myself, and having others think of me, in those terms, nearly all of the time. Today's society seems to be somewhat schizophrenic when it comes to identity and differences. On the one hand difference and diversity are understood to be valuable and worthy of respect, but at the same time there are great pressures to conform and homogenize with one's peers. Visibly identifying oneself with one's culture can be kind of scary, as in some ways it's a limiting act-- I am not "just" like everyone else, because I am identifying with this group, as opposed to all of you, who don't. It's not bad, but it can definitely be an act of setting oneself apart-- of standing out, of isolation. I think that's part of my parents' fear, that I will be somehow limiting myself or restricting myself by identifying myself as Jewish in so public a way-- and also, potentially, setting myself up to be viewed either negatively or exclusively as "Jewish." But I have to say, I don't think that's all that likely. The people I live and work with are supposed to be exemplars of tolerance, and if the mere act of visibly identifying with my heritage and identity winds up stirring up latent antisemitism, I'd rather have that be out in the open than not. It seems incredibly backwards to use the specter of possible abuse or discrimination as a rationale to avoid identifying with your culture, and again, I don't know whether to place the majority of this hostility on my father's personal baggage or his generational experience of not going against the grain (even as he claims to be oh-so-counter-cultural). I'm not sure he'll ever understand that for me, this growth process is somewhat akin to coming out-- it's part of wanting to be comfortable in my own skin and finding my own way of expressing myself and who I am. And I think there's something very wrong when your basic message to people, be they kids or adults, is, "Why can't you be yourself like everyone else?" I like to consider myself pretty open-minded. By which I mean that though I have some deeply held opinions when it comes to things like religion or politics, I try to be open to other points of view, if only to understand where folks are coming from (this could be related to why I spend so much time reading Orthodox blogs or why most presents I buy for my wife are memoirs of people growing up in eclectic religious groups). So it's been interesting during this electoral cycle to hear the Republican party and its mouthpieces going on about how many of their elusive voter demographics they're supposedly going to bag this time. I won't lie, as a liberal late 20-something I have plenty of reasons to not be very happy with Obama-- there are social, military and foreign policy areas where he's made promises he hasn't kept, the economy still isn't very good, and perhaps most galling to the youth vote, has proven himself to be just as corruptible by the game of politics as anyone else. So yes, young people, especially those still politically engaged, are definitely annoyed, which is where folks like JustNew Productions come in. The company, run by two quasi-recent college graduates, has gotten a lot of attention for a Gotye parody video focusing on the various ways Obama has disappointed them. I watched the video and couldn't fault them for their opinions, in fact I share a lot of them. However what's curious about cases like the "Obama that I used to Know" video is how fundamentally Republicans seem to be misreading it. In this clip, a Fox News lady tries to present the filmmakers not only as deeply dissatisfied but also a symptom of how youth voters are so fed up with Obama they're potentially ready to go run to join the Republicans. However if you look at the lyrics of their song (or watch the interview, where they seem bemused by the tone of the questions and framing by the news anchor), their big problem seems to be not only that Obama isn't doing enough to help them economically, but also that he hasn't lived up to the image he presented to young, mostly liberal voters. These kids are annoyed with Obama's hypocrisy about not closing Guantanamo and discomfited by the fact that he is simultaneously a Nobel Peace Prize winner and has been using predator drones for assassinations. They want to relax drug laws and enforcement, and seem to not be fans of Sarah Palin. They're mad about a lack of results in the economy, but also that Obama hasn't lived up to the foreign and domestic policy he promised them. That's a far cry from wanting to go over to the Republican party-- they don't want to elect Romney, they want Obama of 2012 to start acting like the Obama of 2008! The Republicans can't-- or won't-- comprehend that these kids, and many more like them, aren't disaffected moderates whose votes are "in play," they're pissed off liberals who want Democrats to start living up to the values they keep campaigning on. Furthermore, by misreading people like the filmmakers, the Republicans are demonstrating that they don't seem to understand what makes people become Democrats. No matter how much the Republican party tries to rebrand itself, no matter how many open-minded college students claim that they don't care about social issues anymore and they want a big tent, when the rubber hits the road, the present-day GOP still has a social platform, and on many issues, it is in stark contrast to many young people's positions. Reporters have described Romney's pick of Ryan as "reframing" the election along ideological lines; the reality is that for people paying attention, it has always been about ideological lines-- specifically, red lines. No matter how much people may dislike behavior by members or leaders of their party, absent better choices, they will probably stick with them rather than vote for a person-- or a party-- who they disagree with even more. That's just human nature. While young people may have economic opinions (and certainly are affected by economic policy, as they're discovering), my impression is that economic issues alone don't drive many people's votes-- young or old. It's the constellation of other issues, foreign, domestic, and social, that people have more emotional and visceral investment in. Unless the GOP becomes a radically different party within my lifetime, I am fairly confident that I will never vote for a Republican candidate-- because even if I agreed with them on certain issues, the social values of their party are so fundamentally opposed to my own that it would be a betrayal of my other principles to do so. In my opinion, this same phenomenon can be applied to the Jewish vote. Republicans (especially Republican Jews) don't like to hear it, but long as a majority of American Jews still believe in liberal politics, especially on social issues, there's no way the Republicans will get the Jewish vote. That may change over time as shifting demographics alter the political landscape, but until most Jews are right-wing Orthodox, it's not going to happen. Whether you attribute it to naiveté, personality, life experience, or something else, if people believe in liberal values, the fact that liberals aren't living up to their names isn't going to make them vote Republican. It may disappoint them enough that they stop voting entirely (which I suppose is a net win for the other side), but more likely they will hold their nose and cast their vote for what, in their mind, is the lesser of two evils-- like everyone else has been doing for a long time. Pundits can argue and campaigns can spin all they want; if Republicans think frustrated liberals (not moderates) are going to come out and vote for Romney, they're the ones who are naive. The Bet Shemesh culture clash that's been occurring off-and-on for the past year has been pretty upsetting to watch and read about. While my usual reaction to such stories is to jump on the Haredi-bashing wagon, at this point, hearing about all the negative interactions between the communities, I'm filled less with disgust and more with pity. It's so tremendously sad that these two groups of Orthodox Jews seem to not have enough common ground to coexist, and it adds to the pessimism many people have about the ultimate direction of Israeli culture as well as Jewish diversity and tolerance. The Bet Shemesh mess is in particularly sad contrast to the book I just finished, The Jew in the Lotus, which while now rather dated (the events in it took place over a few weeks in 1990, which I never considered "a long time ago" until I did some math), radiates with warmth and love as it describes the various dialogues that occurred (both between Jews and Buddhists as well as between Jews and Jews) during a trip by a Jewish delegation to the Dalai Lama to explain the "secret of surviving Diaspora." The author, Rodger Kamenetz, goes into the visit rather jaded and comes out of it filled with, if not specifically hope for Jewish revival, then at least a great deal of respect and passion for the multiplicities of practice and philosophy within Judaism, represented by the individual participants in the Jewish delegation, who ran the gamut from Yitz and Blu Greenberg to Zalman Schachter-Shalomi. It's tragic to go from reading about different Jews gently disagreeing but still clearly respecting each other to hearing about the latest installment of craziness from Bet Shemesh. Though the school protests seem to have stopped, the war on women (or should I say females, as it includes little girls) seems to be ongoing. Reading about Bet Shemesh, and especially watching the videos focusing on the Haredi crowds who would congregate near the Orot school, made me think of a similar flashpoint ten years ago in the Ardoyne area of Belfast, where Protestant crowds blockaded a Catholic girls' school and harassed the students trying to get in or come out. This led to a twice-daily running of the gauntlet by the girls and their parents, often with police acting as buffers, just to get them in to school. If you watch some of the videos, the hatred and hostility-- directed towards children-- is pretty disturbing. That for me is what Bet Shemesh really comes down to. It's one thing to have ideological disputes. It's even ok to have very heated arguments. But when you decide that you have no common ground, no common language, no starting-place for discussion and need to take to the street-- and particularly when, as at Holy Cross, you are targeting, and effectively abusing, young children, there is a serious problem, a problem with leadership, as well as culture. This isn't to say that there may not be two sides to the Bet Shemesh issue, as there were in Ardoyne. But there need to be some basic lines drawn when it comes to what is legitimate discourse and what isn't. Harassing children most definitely isn't, and I hope, hope, hope, that in ten years' time when Na'ama Margolis is interviewed by Israeli TV, she and her classmates don't show the same signs of PTSD as the Holy Cross girls do. Am I the only one who has a hard time admitting when they don't know something? Growing up I was always considered the family scholar because I could be readily counted on to provide some sort of quip or connection to nearly any topic. The flip side of this, though, was that like many autodidacts, my depth of my knowledge was limited to my select areas of personal interest. History? Religion? Judaism? Genealogy? Check. At one point I even used a Scottish craft magazine to memorize tartans and triumphantly called them out when we would drive past them in the car (my time likely would have been better spent studying subjects I was actually tested on in school, but that's why hobbies are hobbies). The downside of this, however, was that as I got older, I got progressively more uncomfortable admitting when something was beyond my grasp, or simply not very familiar. With my family I would usually admit it, sometimes pseudo-proudly ("What do you mean you don't know how many ounces are in a cup? "), but with people I didn't know very well, I would usually just pretend. Even now, my usual fall-back when someone makes some sort of art or literary reference I don't know is not to say, "Never heard of it," but rather, "I think I've heard of that somewhere..."
This wouldn't be such a big deal except that there are significant life skills that I wish I had acquired much earlier and am now struggling to catch up on. For instance, driving a car. Growing up in a city with good public transportation (and not much sprawl), driving seemed entirely unnecessary, and since it also seemed a little dangerous, was something I decided to avoid until I absolutely had to learn it. Hence me going many years without even getting my license, much less regularly practicing with a car. With my new job I will be commuting around 40 miles a day on the highway, so the past month has been devoted to practicing the route with whoever will put up with me, usually Mama Yid. Usually it goes fine but when things foul up, my first reaction, after fear and anger, is shame. It's humiliating that this is so hard and that it's taken me so long to get to it. It's not made any easier by the fact that Abbot Yid has very little understanding about why this is so challenging for me. Frequently his response to me saying something like, "I still haven't figured out parallel parking," or, "I'm not comfortable driving at night yet," is, "Well you're going to need to figure it out!" Yes, I got that, thanks for the help. I know that in the end being frustrated or embarrassed won't get me where I want to be. Rather than focus on what didn't happen in the past, I need to use the negative feelings as increased motivation to stick with these new skills and develop them to where I want them to be.